Garret Healy, Software Engineer, Jeppesen Inc. The author’s developed the following tables as a crew planning tool. These tables demonstrate how strict FAR Part 117 work rules are in relation to allowed duty time when compared to FAR part 121 subpart Q. The particular problems surrounding WOCL rules associated with reserve assignments pose vastly different situations under FAR 117, dependent upon the type of reserve associated with the FDP assigned, and the time of day with respect to when the reserve begins and the time of day that the FDP begins, while under FAR 121 subpart Q, no distinction in accordance to the diurnal variance had ever been stipulated. Our models will differ from our previous articles, in that we will concentrate less upon duty period construction, and more upon flight crewmember Rostering / Lines construction. The constraints now posed under FAR 117 are dependent upon consecutive days associated with the WOCL, as well as the cumulative FDP constraints under FAR 117 and the cumulative flight time constraints under FAR 121 subpart Q. 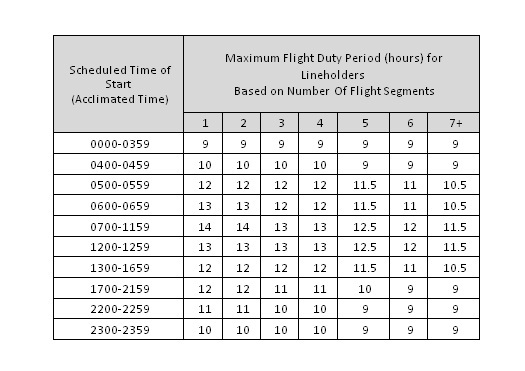 Airlines must schedule efficient Flight Duty Periods and carefully plan when Flight Duty Periods begin as well as how many segments are involved. 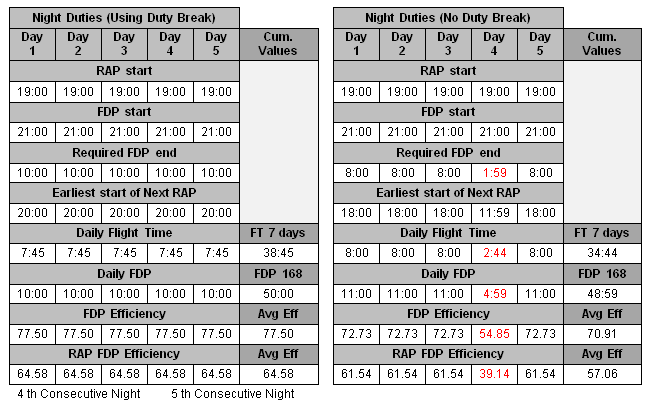 In order to schedule efficient pairings, the Airlines should consider looking at productive hours (flight time) versus non-productive hours (FDP time)/Combined ASB FDP time. Is defined in FAR part 117. Is scheduled before the start of the FDP. Is at least 3 hours. Is not provided until after the first segment in the FDP has been completed. Is provided between 22:00 and 05:00 local time. Is measured from the time that the flightcrew member reaches the suitable accommodation. Is a pilot, flight engineer, or flight navigator assigned to duty in an aircraft during flight time. Is defined in FAR part 1. Means that, prior to beginning the rest period required by 117.25, the flightcrew member is notified by the certificate holder to report for a flight duty period following the completion of the rest period. Includes reporting for an assignment, acknowledging flights to be performed while on duty that will be operated in accordance to FAA regulations, including understanding of the expected conditions that will affect the flight(s) to be performed. Inspections of the aircraft for flight readiness, etc. Means a temperature-controlled facility with sound mitigation and the ability to control light that provides a flightcrew member with the ability to sleep either in a bed, bunk or in a chair that allows for flat or near flat sleeping position. Suitable accommodation only applies to ground facilities and does not apply to aircraft on-board rest facilities. Note: The WOCL is based off of flight crew members last acclimated time. The amount of pre-flight duty before the flight departs the gate. Typically ranges between 0:45 to 1:00; generally contained within a CBA; for the purposes of this paper we will use 1:00. The amount of post-flight duty after the flight arrives at the gate. Typically ranges between 0:15 to 0:30; generally contained within a CBA; for the purposes of this paper we will use 0:15. The minimum time from when an aircraft arrives at the gate, to the time when the aircraft moves away from the gate to allow for sufficient time to unload/load passengers and baggage, and make any required service needs for the aircraft before departure as well as performance of pre-flight checklists, for the purposes of this paper we will use 0:30. Under FAR 117.19, it is permissible to operate beyond the scheduled limitations in FAR 117.13 by 0:30, extensions up 2:00 may be conducted before departure under certain conditions, for the purposes of this paper we will use 0:00. Under 117.25, FCM’s are required to have been scheduled for and have been given a rest period of no less than 30 hours in the 168 consecutive hours preceding the start of a FDP. Under 121 subpart Q, FCM’s are required to have been scheduled for and have been given a rest period of no less than 24 hours in the 7 calendar days preceding the scheduled completion of any flight subject to this subpart. FAR 117.15 mandates that the minimum time spent in a suitable accommodation is 3:00. FAR 117.15, mandates that the time to travel to/from the location used as a suitable accommodation is not part of the required duty beak; generally, the location is relatively close-by. For the purposes of this paper we will use 0:15 each way for travel time, this will equate to 0:30. 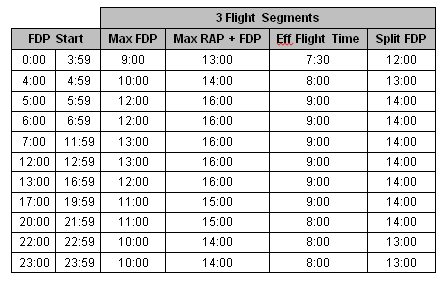 FAR 117.13 contains different FDP limitations based upon the number of flight segments, for the purpose of this paper all FDP will have 2 flight segments. FAR 117.13, mandates that a 0:30 penalty be applied to the FDP limitations in Table B when a FCM reports for an FDP in an un-acclimated state. For purposes of this paper a FCM will be assumed to be in an acclimated state, no penalty shall be applied. A FCM may be re-assigned to an assignment, which contains flight time at any time during an ASB after the FCM reports. For the purposes of this paper it will be assumed that a FCM will serve 1:00 of FDP exclusively on ASB, before being assigned any flight time. Long Call Reserve (LCR) – a FCM is notified that an FDP or SCR assignment has been made and the span of time from point of notification to the start of the assignment will allow for a rest period and any required travel time. Airport/Standby Reserve (ASB) – a FCM is at the airport and is subject to immediate assignment to an assignment, which includes Flight Time. Short Call Reserve (SCR) –a FCM is expected to report for the FDP without an intervening rest period. Since the FCM may need to travel to the location where the FDP will start, most airlines will have a minimum amount of time to allow for the ‘call out’. The amount of time from the start of the short-call reserve until the report for the FDP is known as RAP, Reserve Availability Period, it includes the ‘call out time’, and may not exceed 14 hours. 1 Part 117 has Daily FTL’s governed under 117.11. 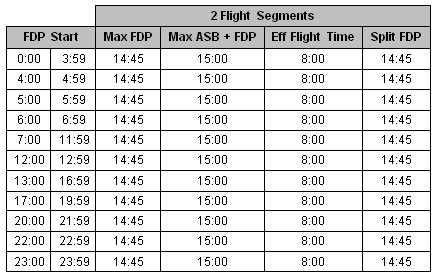 Based upon FDP start time, the limitation is either 8:00 or 9:00 as defined in Table A.
Evaluated on a leg by leg basis, FCM may not continue a flight if before takeoff it is known that the FTL will be violated. 2 Part 121 has Daily FTL’s governed under 121.471(a)(4). The scheduled limitation is 8:00. A FCM may continue the assigned FDP as long as the flight itinerary is the same as what the FCM began with no further constraints (legal to start, legal to finish), else a reevaluation at the point of rescheduling must take place. 1 Part 117 has Daily FTL’s governed under 117.13. 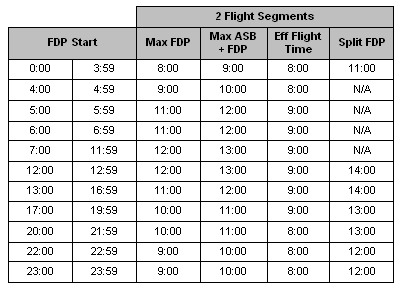 Based upon FDP start time, the scheduled limitation is defined in Table B.
Extensions to the assigned FDP are permitted in accordance with 117.19. A scheduled flight time in the 24 hours preceding the scheduled completion of a flight segment. A required rest period in the 24 hours preceding the actual expected completion of a flight segment. The may be reduced due to operational contingencies before takeoff. A compensatory rest period will be required following the release of a duty period that is preceded by a reduced rest period, this will effectively limit the duty period to a maximum of 16 or 15 hours dependent upon the scheduled flight time in the 24 hour period, and the compensatory rest period must commence within 24 hours of the start of the reduced rest period. 1 Part 117 has Consecutive nighttime operations governed under 117.27.
iii. The rest oppurtunity must comply with the conditions specified in 117.15(a), (c), (d), and (e). Otherwise, the limitation is 3 Consecutive nighttime operations. 2 Part 121 subpart Q has no limitations. Authors note: An early morning FDP assignment can also be considered a night duty when the FDP starts at any time between 02:00 and 05:59 (inclusive). i. 100 hours in any 672 consecutive hours. i. 60 hours in any 168 consecutive hours. i. 30 hours in any 7 calendar days. ii. 100 hours in any calendar month. 1 Part 117 has specific limitations for FCM assigned to reserve assignments governed under 117.21. All reserve assignments are considered to be duty for the purposes of determination of all rest requirements under 117.25. 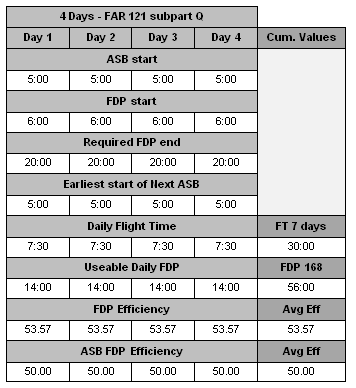 Airport/Standby (ASB) Reserve is considered FDP and is subject to the FDP Limitations (117.13) in Table B and the Flight Time Limitations (117.11) in Table A using the start time of the assignment. ASB is subject to the Consecutive nighttime operations under 117.27 as well as the rest requirements under 117.25. Short-Call Reserve (SCR) is not considered FDP, but is considered to be on RAP. RAP has specific limitations for while on RAP and combined RAP and FDP limitations for FDP’s assigned during the RAP. RAP’s are subject to the rest requirements under 117.25. Long-Call Reserve (LCR) is not considered FDP and is not subject to the rest requirements under 117.25, but before being assigned to and FDP or SCR assignment the rest requirements must be satisfied, and should the FDP start before the WOCL and continue into the WOCL at least 12 hours notification must have been given. 2 While Part 121 subpart Q no specific limitations for FCM assigned to reserve assignments, A FCM is considered to be on duty, and when assigned to a duty that contains flight time, will still be subject to the pertinent flight time limitations and rest requirements under section 121.471(b) and (c). FAR 121 subpart Q, is less efficient when compared to FAR 117, this is due to the weekly flight time limitation of 30 hours in 7 calendar days, this limits the daily flight time to an average of 6:00 across 5 calendar days, and 7:30 hours across 4 calendar days. FAR 121 subpart Q, is not constrained by diurnal variations, thereby, the average FDP efficiency and the average Combined ASB FDP efficiency remains constant across all time frames at 42.86/40.00 for 5 calendar days, and 53.57/50.00 for 4 calendar days. 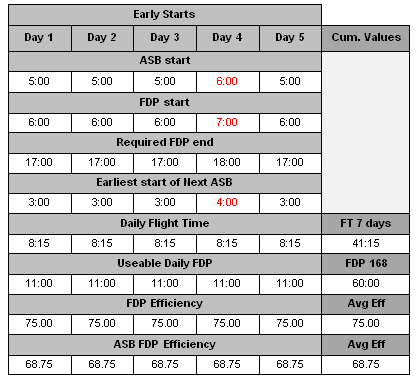 FAR 117, showed Early Start Duties had average efficiencies of 75.00/68.75 for FDP/Combined ASB FDP, respectfully. Day 4, was constrained to have an ASB start no earlier than 6:00 due to the inability to apply a Duty Break. These efficiencies were the highest observed. FAR 117, showed the worst efficiencies for Night Duties. When the Night Duty apply a Duty Break of 3:00 the efficiencies 47.50/43.18 for FDP/Combined ASB FDP. 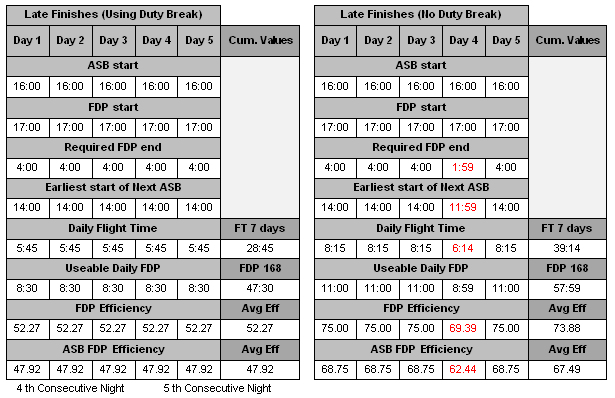 The efficiencies improve when the duty break is not applied, 66.96/60.19 for FDP/Combined ASB FDP, respectfully. Day 4, was severely constrained to a very short FDP/Combined ASB FDP with a very low flight time. FAR 117, showed the same type of trend with Late Finishes. When the Late Finishes apply a Duty Break of 3:00 the efficiencies 52.27/47.92 for FDP/Combined ASB FDP. The efficiencies improve when the duty break is not applied, 73.88/67.49 for FDP/Combined ASB FDP. Day 4, was severely constrained to a very short FDP/Combined ASB FDP with a low flight time. The increase in efficiencies when the duty break is not applied, was primarily due to the ability to use some of the time occupied by the duty break with flight time. Under FAR 117 and FAR 121 subpart Q, if the amount of time a FCM is required to sit on ASB increases, the efficiencies diminish; this is expected, as ASB time is viewed as unproductive time. Under FAR 117 and FAR 121 subpart Q, if the numbers of flight segments increases, the efficiencies diminish, this is expected, as the minimum connect time will diminish the amount of available time for flight time. Allowing a FCM to serve on ASB beyond 3:00 hours before beginning an assignment that includes Flight time seems impractical when no duty break will be applied, if a duty break is applied 4:00 seems to be the limit. Scheduling a FCM for more than 3 days for the Late Finishes and Night Duties with no duty break seems to be impractical especially when a FCM to serve on ASB for more than 2:00 before beginning an assignment that includes Flight time. The particular problems surrounding WOCL rules associated with reserve assignments, pose vastly different situations under FAR 117 dependent upon the type of reserve associated with the FDP assigned, and the time of day as to when the reserve begins and the time of day that the FDP begins, while under FAR 121 subpart Q, no distinction in accordance to the diurnal variance had ever been stipulated. Our models will differ from our previous articles, in that we will concentrate less upon duty period construction, and more upon flight crewmember Rostering / Lines construction, as the constraints now posed under FAR 117 are dependent upon consecutive days associated with the WOCL, as well as the cumulative FDP constraints under FAR 117 and the cumulative flight time constraints under FAR 121 subpart Q. 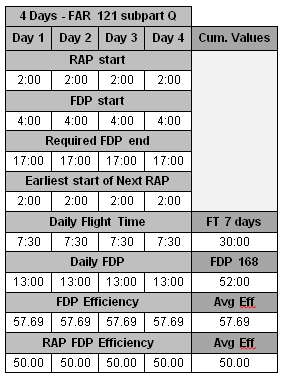 In order to schedule efficient pairings the Airlines should consider looking at productive hours (flight time) versus non-productive hours (FDP time)/Combined RAP/ FDP (Duty time). Includes reporting for an assignment, acknowledging flights to be performed while on duty, will be operated in accordance to FAA regulations, including understanding of the expected conditions that will affect the flight(s) to be performed. Inspections of the aircraft for flight readiness, etc. The minimum time from when an aircraft arrives at the gate, to the time when the aircraft moves away from the gate to allow for sufficient to unload/load passengers and baggage, and make any required service needs for the aircraft before departure as well as performance of pre-flight checklists, for the purposes of this paper we will use 0:30. 1 Under 117.25, FCM’s are required to have been scheduled for and have been given a rest period of no less than 30 hours in the 168 consecutive hours preceding the start of a FDP. 2 Under 121 subpart Q, FCM’s are required to have been scheduled for and have been given a rest period of no less than 24 hours in the 7 calendar days preceding the scheduled completion of any flight subject to this subpart. FAR 117.15, mandates that the time to travel to/from the location used as a suitable accommodation is not part of the required duty beak, generally, the location is relatively close-by; for the purposes of this paper we will use 0:15 each way for travel time, this will equate to 0:30. Airlines have various policies regarding minimum time from when a FCM is notified to report for an FDP and the start time of the FDP. For the purposes of the paper, it will be assumed that the FCM is notified at the start time of a RAP, and the FDP assigned will start following a 2:00 call-out. 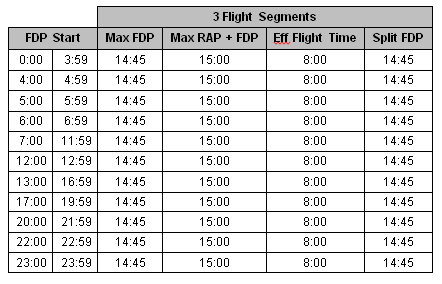 FAR 117.13 contains different FDP limitations based upon the number of flight segments, for the purpose of this paper all FDP will have 3 flight segments. FAR 117.13, mandates that a 0:30 penalties be applied to the FDP limitations in Table B when a FCM reports for an FDP in a un-acclimated state. For purposes of this paper a FCM will be assumed to be in an acclimated state, no penalties shall be applied. 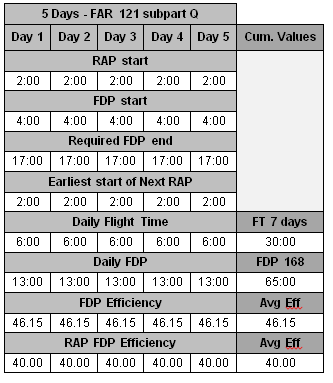 FAR 121 subpart Q, is not constrained by diurnal variations, thereby, the average FDP efficiency and the average Combined RAP FDP efficiency remains constant across all time frames at 46.15/40.00 for 5 calendar days, and 57.19/50.00 for 4 calendar days. FAR 117, showed the worst efficiencies for Night Duties, that did not apply a Duty Break of 2:00, day 4, was severely constrained to a very short FDP/Combined RAP FDP with a very low flight time. The average efficiency was 70.91/57.06 for FDP/Combined RAP FDP, respectfully. 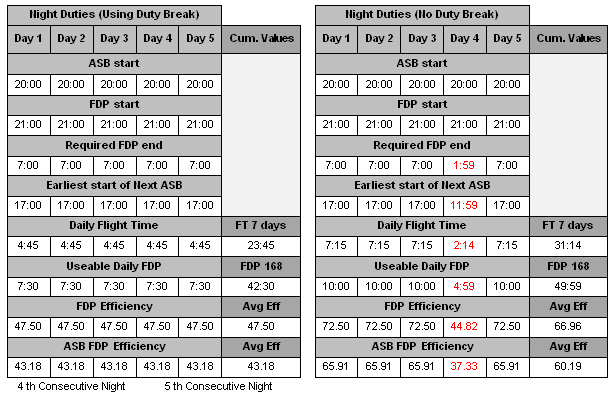 When Night Duties apply the Duty Break, the efficiencies improve to 77.50/64.58. 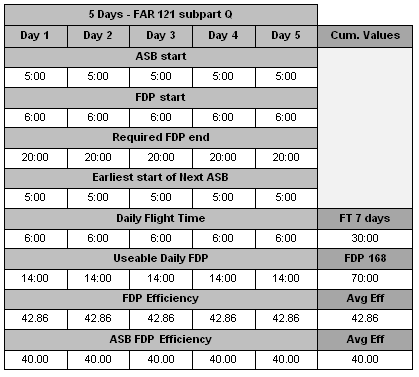 FAR 117, showed the same type of trend with Late Finishes, with no Duty Break demonstrating lower efficiencies with 75.48/64.88 for FDP/Combined RAP FDP, respectfully, again, day 4, showed the lowest performance due the constrained FDP/Flight time. When Late Finishes Duties apply the Duty Break, the efficiencies improve to 79.55/67.31. 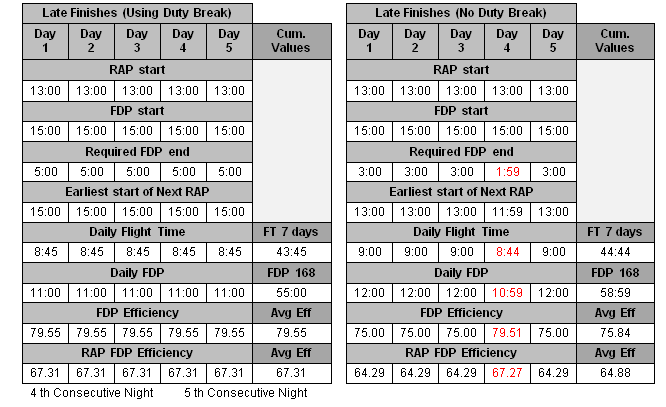 Late Finishes Duties had the highest efficiencies due to high daily FDP/Flight Time values associated with diurnal variations. 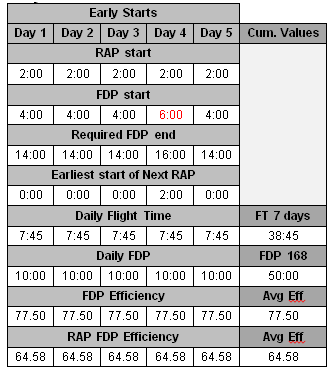 FAR 117, showed Early Start Duties had average efficiencies of 77.50/64.58 for FDP/Combined RAP FDP, respectfully. Day 4, was constrained to have a FDP start no earlier than 6:00 due to the inability to apply a Duty Break. The use of duty breaks associated with split duties for both Night Duties and Late finishes improves efficiencies. Early starts, pose the most compelling problem when RAPs are assigned for more than 3 consecutive days, it is understood that not every day a FCM will actually be assigned an FDP that will infringe upon the RAP, but the potential does exist.